As I stuck my foot into the elevator at the our offices — from the inside, of course — to hold it open for a colleague this morning, it struck me. Where's the usability? Many of the principles of user-centric design that we hold dear in interaction design, UX, and web development are not as readily applied to everyday objects and things you interact with on a day-to-day basis. Wouldn't it be nice if they were? To use the elevator in question as an example of borderline terrible usability, we joked on the ride up to the 5th floor about the flaws in the design of how something we all take for granted — and use regularly — works. Elevators are simple machines, right? They go up, down, and stop at various floors. You push a button and an alarm sounds, or you turn a key and lock it in place. A couple more buttons let you hold the doors open on a specific floor, or shut them if you're so inclined. Nothing really complex to it, is there? You'd be surprised at how much can go wrong with something so straightforward. Let's look at a couple of specific examples of why this elevator makes for an inconvenient and at times incredibly frustrating user experience, and how we can draw parallels to UX design in the process. I pressed the button, didn't I? 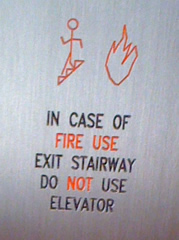 The elevator in question appears to have a mind of its own. Take this scenario: I press the button in the lobby to go up; unbeknownst to me, one of the elevator cars, waiting in the lobby, already had its doors closing. They close, not stopping due to my button press, and the button deactivates itself automatically. I back up, not realizing that the call button is no longer selected, and wait impatiently until realizing that I have to press it again. Annoying, isn't it? So what's wrong here, and how does this relate to interaction design? Well, in this specific case, I'd like to draw your attention to proper error handling. When something doesn't work properly, most folks expect some kind of messaging coming back their way explaining what went wrong, why, and what they can do to fix it. In the case of the elevator, there's no feedback mechanism letting the user know that their request failed. One of the core tenets of UX design in this bold, shiny, message-bubble-happy Web 2.0 world is to provide clear, obvious feedback to the user when they're interacting with your web application. In the case of the elevator, it may be as simple as chiming a bell and holding the door open if it's already open when you press the call button, but in your designs it's something that needs to be taken into account. Have a standardized methodology for providing your users feedback in case of errors, and make it easy for them to correct what went wrong and try the action again. 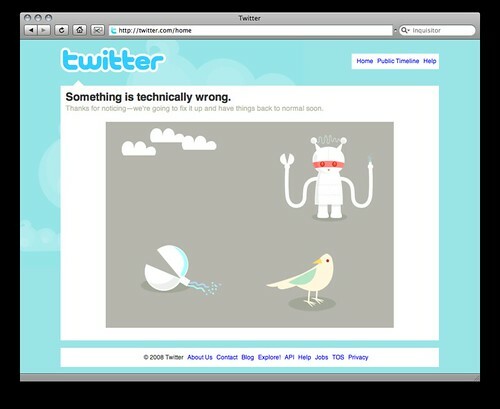 If it's something they can't fix, provide user-friendly messaging that explains what's going on, so as not tocause a revolt amongst your users (assuming it's not a common error). This one gets everyone who uses this elevator at one time or another. 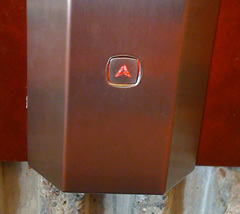 Regular users of the elevator will get used to buttons being in a certain location. 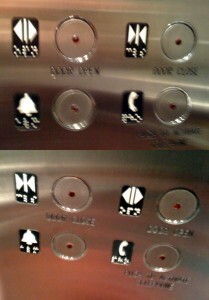 This elevator is special; the buttons for opening and closing the doors are inverted on the other side of the elevator. If you're accustomed to where they are on one side, you'll automatically hit the same button on the other side's panel — in this case, having the opposite of the intended effect. Oops! There's a pretty striking parallel here to website navigation design: switching navigational elements from page to page on a website will definitely confuse your users. Why would you design an elevator with mirrored navigation controls? It appears that many of our best practices in interactive media would apply just as easily to industrial design. While changing design elements around between templates on a site might work as long as their positioning is clearly defined from page to page, you should really spend the time and justify why you need to build an inconsistent navigation. In our test subject's case, there's no clear reasoning behind the mirrorring of the top row of buttons, all the while leaving the bottom two buttons in the same positions. It seems quite random, considering they're the only set of controls where the positioning has changed, from one side of the elevator to the other. User testing — even the so-called "Mom test" — goes a long way in cases like this — what may seem visually pleasing or quirky as an interaction designer may cause your users no end of grief and frustration. Take the time to not only ensure that your site's navigation is consistent and well-structured, but also to test your designs with users who may not be web-savvy and see if it stands up to their usage. Designers and developers have a tendency to become blind to their own work, as time passes; what makes perfect sense to you may have the opposite effect on your users. Enchanting your audience with an attractive, yet highly-usable design and information architecture will help to enlist regular users. These happy regulars, in turn, may lead to more sales, or, with luck, a core group of users who evangelize your site or product and save you time, energy, and money in the long run. I always find the warnings attached to elevators in high-rises highly entertaining, and this one is certainly no exception. Notice the strangely highlighted words in the fire warning on the left? "Fire Use" and "Not" are what stand out to me at a quick glance. Does that make much sense to you? 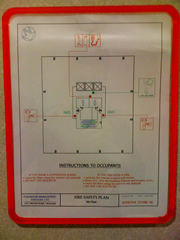 Beside it, we have an elaborate schematic of the 5th floor, including our emergency exits, the locations of the nearest fire extinguishers, telephones, and of course, the ever-important bathrooms. If I'm at the office and a fire breaks out on my floor, am I going to sit for five minutes trying to decipher a cryptic blueprint, make a quick trip to powder my nose, or am I going to run down the emergency stairs at full-tilt and pull the nearest fire alarm? What am I getting at with all of this? Providing clear, concise supporting information on your site is just as important as your visuals and textual copy. As Jakob Nielsen preaches, use consistent and obvious language, placement, and terminology to refer to navigational elements and other areas of your site. Providing a help area for your users to communicate with you — and to refer to in case of the inevitable problems that occur while running a large site — is also an important task that may get neglected in favour of further development of new or more elaborate features. Don't let those things fall by the wayside and you'll be doing yourself a favour. Do you have any interesting experiences with the usability of everyday objects that you'd like to share? If so, we'd love to hear about them. This post is a slightly revised version of one originally published on the Habañero Consulting Group blog. Top image courtesy of krnlpanik on Flickr.